Armed men without insignia (so-called "little green men") in Simferopol Airport, 28 February 2014. Little green men (Russian: зелёные человечки, translit. zelyonye chelovechki, Ukrainian: зелені чоловічки, translit. zeleni cholovichki) refers to masked soldiers in unmarked green army uniforms and carrying modern Russian military weapons and equipment that appeared during the Ukrainian crisis of 2014. The term was first used during the annexation of Crimea by the Russian Federation, when those soldiers occupied and blockaded the Simferopol International Airport, most military bases in Crimea, and the parliament in Simferopol. They were also known as Polite People (Russian: вежливые люди, translit. vezhlivye lyudi) as they were perceived to have behaved peacefully with little practical interference with the daily activities of the residents. In March 2014, the Finnish magazine Suomen Sotilas (Soldier of Finland) published an analysis of the weapons and equipment seen on photos of "little green men". The article goes on to conclude that with a very high probability "these troops are the 45th Guards Separate Reconnaissance Regiment of the VDV" based in Kubinka, Moscow. Other media has published a photo of an unmarked Russian soldier armed with a VSS Vintorez taken as proof of deployment of Russian special forces. Initially, President of Russia Vladimir Putin stated that the men in green were not part of Russian Armed Forces, but groups of local militia who had seized their weapons from the Ukrainian Army. The SACEUR of NATO Allied Command Operations General Philip Breedlove said that these "green men" were in fact Russian troops. 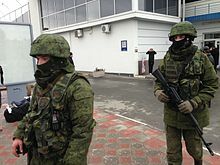 In March 2014, Putin continued to maintain that there was no pre-planned intervention, but that "the heavily armed, tightly coordinated groups who took over Crimea's airports and ports at the start of the incursion – they were merely spontaneous 'self-defence groups' who may have acquired their Russian-looking uniforms from local [military] shops (voyentorg)". According to the Ukrainian Gun Owners Association, Ukrainian law does not allow the selling or carrying of firearms other than for hunting. On 17 April, President Putin admitted for the first time publicly that Russian special forces were involved in the events of Crimea, for the purposes of protecting local people and creating conditions for a referendum. Later, he admitted that Russian Armed Forces had blocked Ukrainian Armed Forces in Crimea during the events. In answer to the question of the presence of Russian troops in Crimea, Russian Minister of Defence Sergey Shoygu said, "Regarding the statements about use of Russian special forces in Ukrainian events, I can only say one thing – it's hard to search for a black cat in a dark room, especially if it's not there," and added cryptically that searching for the cat would be "stupid" if the cat is "intelligent, brave, and polite". In April 2015, retired Russian Admiral Igor Kasatonov (Игорь Касатонов [ru]) said that the "little green men" were members of Russian Spetsnaz special forces units. According to his information, Russian troop deployment in Crimea included six helicopter landings and three landings of Ilyushin Il-76 with 500 people. During the War in Donbass, a Reuters correspondent reported from a settlement of Kolosky in Donetsk Oblast on 26 August 2014 that dozens of heavily armed strangers with Russian accents had appeared on the weekend and set up a road block (about 10 kilometres from the Russian border). The men had white arm bands, the same identifying mark that was worn by ten men captured a few kilometers (miles) away by Ukrainian forces and who, in a video released on Tuesday (26 August 2014), said they were Russian paratroopers. A report by the BBC referred to the unmarked Russian forces in the Donbass as a "Ghost Army". On 13 January 2015, the Ukrainian news outlet censor.net reported Russian special forces in Luhansk along with footage of eight unmarked soldiers in green army uniforms patrolling a street there with several of them carrying an AS Val, a weapon exclusive to the Russian Armed Forces. On 17 December 2015, Russian president Putin confirmed, albeit elliptically, the presence of Russian people in Ukraine who were engaged in certain tasks, including in the military sphere, and added that this did not mean the presence of the regular Russian army (though other military forces, like marines, were not ruled out) in Ukraine. By end of 2017, OSCE observatory mission accounted for around 30,000 military-style personnel crossing from Russia to Donbass just at two border checkpoints it was allowed to monitor. ^ a b Shevchenko, Vitaly (11 March 2014). ""Little green men" or "Russian invaders"?". BBC News. Retrieved 18 November 2015. ^ Oliphant, Roland (2 March 2014). "Ukraine crisis: 'Polite people' leading the silent invasion of the Crimea". The Daily Telegraph. Retrieved 18 November 2015. - Brady, Tara (3 March 2014). "Shocking pictures show people in Crimea taking SELFIES with Russian masked gunmen as Ukraine teeters on the brink of war". Daily Mail Online. Retrieved 18 November 2015. - Shaun Walker (16 March 2016). "Syrian mission restores pride in Russian military after years of decay". The Guardian. Moscow. Retrieved 17 March 2016. ^ Pulkki, Arto (3 March 2014). "Crimea Invaded By High Readiness Forces of the Russian Federation". Suomen Sotilas (Soldier of Finland). Helsinki. Archived from the original on 30 March 2015. Retrieved 21 September 2015. ^ Vaux, Pierre. "Ukraine Presents Russian Sniper Rifle Taken From Captured Soldiers, Will Charge Them With 'Terrorism'". pressimus.com. Retrieved 19 April 2017. ^ "Путін: В Криму діють не війська РФ, а "загони самооборони", які забрали зброю в українців". еспресо tv. 4 March 2014. Retrieved 31 March 2014. ^ Головнокомандувач НАТО у Європі вважає, що всі воєнізовані формування у Криму є армією РФ [Chief of NATO in Europe believes that all paramilitary forces in Crimea are from the army of the Russian Federation] (in Ukrainian). RBK Ukraine. 12 March 2014. Retrieved 9 November 2017. ^ Fernández, Rodrigo (4 March 2014). "Putin no descarta una intervención si el caos se apodera de Ucrania" [Putin does not rule out intervention if chaos takes hold of Ukraine]. El País (in Spanish). Retrieved 9 November 2017. ^ Kaufmann, Stefan (4 March 2014). "Kommentar: Der Unberechenbare" [Commentary: The Unpredictable]. Handelsblatt (in German). Retrieved 9 November 2017. ^ Borger, Julian (5 March 2014). "Putin offers Ukraine olive branches delivered by Russian tanks". The Guardian. Retrieved 9 November 2017. ^ Avril, Pierre (4 March 2014). "Ukraine : Poutine souffle le chaud et le froid" [Ukraine: Putin blows hot and cold]. Le Figaro (in French). Retrieved 9 November 2017. ^ Kravchenko, Yevhehia (11 January 2012). Українська асоціація власників зброї: вільні люди носять зброю, раби - ні [Ukrainian association of gun owners: free people carrying weapons, slaves - do not]. Ukrainian Association of Gun Owners (in Ukrainian). Retrieved 9 November 2017. ^ Путин: в Крыму действовали российские военные [Putin: there were Russian military operating in Crimea]. Radio Free Europe/Radio Liberty (in Russian). 17 April 2014. Retrieved 19 November 2015. ^ Lally, Kathy (17 April 2014). "Putin's remarks raise fears of future moves against Ukraine". The Washington Post. Retrieved 19 November 2015. ^ "Direct Line with Vladimir Putin". President of Russia. 17 April 2014. Retrieved 19 November 2015. ^ Gregory, Paul Roderick (5 May 2014). "Putin's 'Human Rights Council' Accidentally Posts Real Crimean Election Results". Forbes. Archived from the original on 28 June 2014. Retrieved 27 February 2016. ^ Путин: Украинских военных в Крыму блокировали российские войска [Putin: Ukrainian militia in Crimea were blocked by Russian troops]. liga.net (in Russian). 17 November 2014. Retrieved 9 November 2017. ^ Шойгу о 'зеленых человечках' на Украине: глупо искать черную вежливую кошку в темной комнате [Shoygu about the 'green men' in Ukraine: it's foolish to look for a black polite cat in a dark room]. Moskovskij Komsomolets (in Russian). 17 April 2014. Archived from the original on 25 April 2014. Retrieved 10 April 2015. ^ "Kiev's claims over special forces 'resemble paranoia': Russia". Zee News. 17 May 2014. Retrieved 21 March 2015. ^ a b Tsvetkova, Maria (26 August 2014). "'Men in green' raise suspicions of east Ukrainian villagers". Reuters. Retrieved 19 November 2015. ^ Sweeney, John (8 September 2014). "MH17 disaster: Russians 'controlled BUK missile system'". BBC News. Retrieved 8 September 2014. ^ "Russian special forces in Luhansk: so called insurgents armed with AS "Val" assault rifles - the weapon used by the Russian Federation Army only". Censor.net. Interfax-Ukraine. 13 January 2015. Retrieved 9 November 2017. ^ Nadia Khomami (17 December 2015). "Vladimir Putin press conference: 'Russian military personnel were in Ukraine' - as it happened". theguardian.com. Retrieved 17 December 2015. - "Большая пресс-конференция Владимира Путина". kremlin.ru (in Russian). Moscow: President of Russia. 17 December 2015. Retrieved 17 December 2015. Мы никогда не говорили, что там нет людей, которые занимаются решением определённых вопросов, в том числе в военной сфере, но это не значит, что там присутствуют регулярные российские войска. - "Putin: Russia did have people in Ukraine doing 'certain military tasks'". Moscow. Reuters. 17 December 2015. Retrieved 17 December 2015. "We never said there were no people there who were carrying out certain tasks including in the military sphere," Putin told an annual news conference. ^ "Response to Chief Observer of the Observer Mission at the Russian Border Checkpoints Gukovo and Donetsk | Statement to the PC". Wikimedia Commons has media related to Unmarked soldiers during the annexation of Crimea by the Russian Federation. Ash, Lucy (29 January 2015). "How Russia outfoxes its enemies". BBC News Online. Retrieved 7 April 2015.